Luthercare for Kids honors connectedness, inside and out. We welcome and initiate partnerships with complementary organizations and individuals, recognizing that, together, we can more powerfully impact the communities we serve. Luthercare for Kids currently partners with local congregations and churches including Grace Lutheran Church, Lancaster; Faith United Lutheran Church, Denver; and Community Bible Church, Marietta. Luthercare for Kids has been a longstanding partner with the United Way of Lebanon and the United Way of Lancaster. 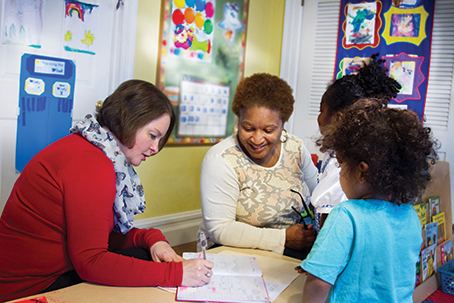 Our partnership with both United Ways make scholarships possible for children and families that otherwise would not be able to access a high quality early care and learning program. Our partnership also enables Luthercare for Kids to operate the Mentoring Program for home providers in both counties, impacting 150 to 200 children annually. The Mentoring Program for home providers works in collaboration with local libraries in both Lancaster and Lebanon to encourage both home providers and their clients to access the resources available. Through this unique partnership home providers are welcomed into the library to learn how to access materials and make use of resource rooms in order to provide appropriate learning experiences from their homes. The program aids in the distribution of resources to providers including literature and kindergarten readiness materials. Luthercare for Kids works closely with the local school districts in each of our communities to provide kindergarten readiness and transition activities that help children start school off right, and Luthercare for Kids partners with the Lancaster-Lebanon Intermediate Unit 13 to offer Pre K Counts at all of our locations. Luthercare values the chance to work collaboratively, recognizing and rejoicing in the collective power of many different gifts. We embrace the opportunity to more powerfully make a difference in the lives of the people we serve. Have thoughts about a potential partnership? Please feel free to contact us with your ideas.